The vector pKLMF-FX directs high-level intracellular expression of a recombinant protein fused to the maltose binding protein (MBP) in the yeast Kluyveromyces lactis. It is compatible with the K. lactis Protein Expression Kit (NEB #E1000). MBP fusion proteins expressed from pKLMF-FX can be affinity purified from cell lysates using amylose resin (NEB #E8021). MBP can be removed from purified fusion proteins by digestion with Factor Xa protease (NEB #P8010). Vector pKLMF-FX contains the strong K. lactis PLAC4-PBI promoter (1), DNA encoding E. coli maltose binding protein (MBP) with a C-terminal Factor Xa site, a universal multiple cloning site (MCS), the K. lactis LAC4 transcription terminator (TT), and a fungal acetamidase selectable marker gene (amdS) expressed from the yeast ADH1 promoter (PADH1). 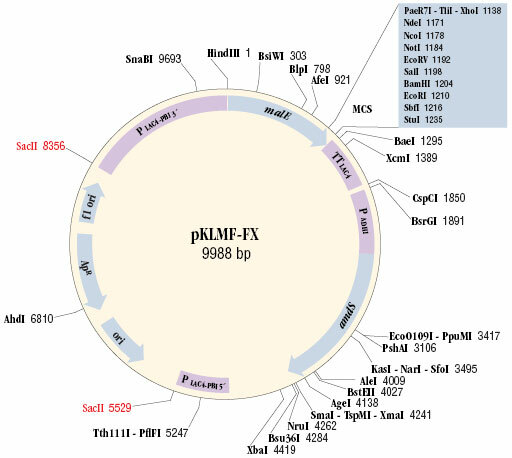 An E. coli replication origin (ori) and ampicillin resistance gene (ApR) is present for propagation of pKLMF-FX in E. coli. SacII-linearized pKLMF-FX integrates into the LAC4 locus of the K. lactis genome upon transformation of K. lactis competent cells. After transformation of K. lactis cells by a pKLMF-series vector, its targeted integration into the LAC4 promoter locus can be confirmed by whole-cell PCR using an adaptation of Optional Methods I and II of the K. lactis Protein Expression Kit Instruction Manual (NEB #E1000). In these methods, Integration Primer 2 is a reverse primer that anneals to a specific region of DNA encoding the α−mating factor secretion leader sequence in pKLAC-series vectors, a region that is absent from pKLMF-series vectors. For assessment of the integration patterns of pKLMF-series vectors, a primer with the sequence 5´ d(GTTTACCTTCTTCAGTTTTCAT) 3´ should be used in place of the kit’s Integration Primer 2 in these protocols (2). Whole cell PCR using this primer in conjunction with either Integration Primer 1 or Integration Primer 3 will each yield a 2.3 kb diagnostic amplicon. Colussi, P.A. and Taron, C.H. (2005). Appl. Environ. Microbiol. 71, 7092-7098. Foster JM, Raverdy S, Ganatra MB, Colussi PA, Taron CH, Carlow CK (2009). The Wolbachia endosymbiont of Brugia malayi has an active phosphoglycerate mutase: a candidate target for anti-filarial therapies. Parasitol Res. 104, 1047-52.